Hi loves! Enjoyed your Saturday? I sure did, my parents visited us today and we went to the city for a bit of shopping this afternoon, also had lovely dinner preparedby the boyfriend - risotto with all kinds of mushroom, it was delicious ♥. Today I am showing you an awesome, unique, gorgeous polish that unfortunately can not be bought. It is a franken made by Mimi from Makeup Withdrawal. She was so kind to send me 8 (!) mini bottles of frankens along with 4 Pure Ice lacquers (love them! 1 of them is Heartbreaker ♥), a NOPI and 2 Spoiled polishes (yes, spoiled is what I am, definitely!). I love them all to bits so thanks again dear dear Mimi, hope you enjoy your package and when the new Catrice lacquers are released prepare yourself for round 2 ;-)! This is Bright Eyed and it has medium (matte?) 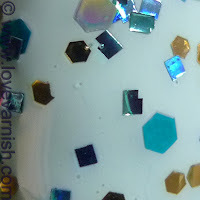 teal hexes, medium holo silver hexes, small light gold hexes and small light blue square glitter in a clear base. It applied SO easy, no clumping or anything! 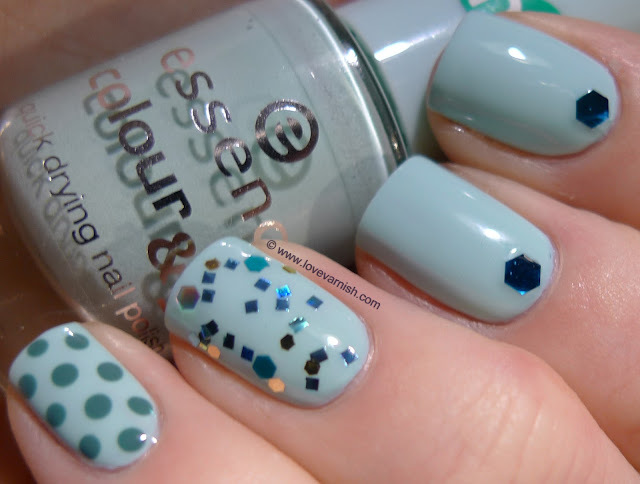 The color combo is gorgeous and can be worn over a similar shade but would also look great over a purple I think. I used Essence You Belong To Me (2 coats) as my base and topped my thumb and ringfinger with Makeup Withdrawal (I am just using her blog name as brand name since these frankens should be produced in large batches - they are awesomeee) Bright Eyed, my index and middle finger got a single blue glequin to decorate and the pinky was dotted with Sinful Colors Athens. Hope you like this and tell me, do you love the franken Mimi made? This nail polish is really pretty! I normally don't like glitter nail polishes, but your color combinations are always very tempty =). Aww thanks so much :). Very sweet! These nails look so cheerful!! <3 I really love You belong to me, it's a gorgeous colour! And your combo with dots and glitters is amazing! Thank you Niky for the sweet words!